Running Stag, who ran on three continents during a forty-race career around the turn of the century, has died aged 18. Having reportedly been ill for some time, he passed away on June 3 at Taepyung Farm, South Korea, where he had been standing at Stud since 2009. One of the most popular racehorses of his time, Running Stag [Cozzene – Fruhlingstag (Orsini)] competed everywhere from the open heath of Newmarket to the desert of Nad Al-Sheba, the gentility of Saratoga and the hustle and bustle of Sha Tin. Owned by British businessman Richard Cohen and trained at Epsom by Philip Mitchell, he became renowned for his frequent forays abroad. After debuting as two-year old in France, he raced in the UK, France and Germany in 1997, picking up his maiden win at Lingfield Park. Following a victory at Deauville in August 1998, his jockey mentioned that he may be more suited to running in America and shortly afterwards, he was duly sent across the Atlantic for the first time, finishing seventh in the Breeders’ Cup Classic that November. As a five-year old in 1999, he began his year at the Dubai World Cup for before returning to the US where he secured his first Group victory, the Brooklyn Handicap at Belmont Park. Shuttling back and forth from the UK, he went on to win another Stakes race that summer, the Saratoga Breeders’ Cup Handicap. After a brief stop at his old haunt of the all-weather surface at Lingfield Park he headed for Hong Kong in December where he was narrowly beaten into second place in the Group 1 Hong Kong Cup. Another attempt on the Dubai World Cup followed the next March, before he spent the remainder of his final year as a racehorse back in the US, winning the Massachusetts Handicap at Suffolk Downs. His final race was the Arlington Million Stakes in August 2000. Although never a prolific winner – he won seven of his forty starts – Running Stag earned over $1.6Million in prize money. 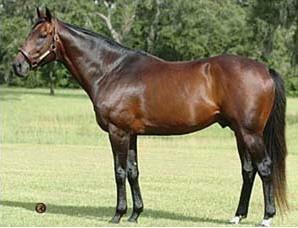 Retired to Stud, he had middling success, producing six Stakes winners and earnings of approaching $10 Million. Running Stag first came to the attention of Korean buyers when his filly Pocketful Of Money (out of Miss Deep Pockets by Buckaroo), won the KRA Cup Classic at Seoul Racecourse in 2007. His own tough, grinding style would have been ideal for the sand at Seoul and Busan. He was purchased by C&A for their Taepyung Stud Farm for $350,000 in late 2008 and began Stallion duties in the 2009 breeding season. By 2011, failing health was limiting the number of mares he could cover, but his first crop of two-year olds went through the sales ring early this year and were enthusiastically received by buyers and his second crop is likely to be sought after too. The two-year olds are set to make their racing debuts soon. When I got the news that stag had died I was so sad & cryed like a baby. When trained in Epsom by Mr Mitchell I lived on him for year.you didn’t know he was under you . I,L,H.